Jalan Sultan Ismail, Kuala Lumpur. Its Essence Restaurant is featuring a delectable spread of imperial specialities from the nine states of Malaysia. 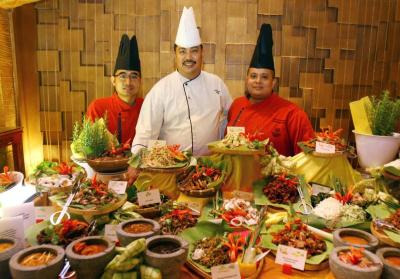 Delectable spread: (from left) Chefs Jamsari, Abdul Razak and Kamaruddin showing some of the dishes served in the buffet. The buffet has a variety of authentic and traditional cuisine that was carefully chosen by chefs Abdul Razak Mohd Ali, Kamaruddin Adnin and Jamsari Mohamad. Whet one’s appetite with Daging Masak Hitam which was a favourite dish of Sultan of Kedah Sultan Mudzaffar Shah III. Ayam Madu was originally one of the favourite food of the Sultan Pahang and this is a must-try. Another signature traditional food that was a favourite of the royalty is the Grilled Fish with Air Assam and Kuah Kicap. The star dish in the lavish buffet is none other than Melaka Assam Pedas. The sourish and refreshing dish was a favourite of Sultan Mansur Shah of Malacca. The dish will be prepared on request at its action stall. Pais Ikan (baked marinated fish with coconut) was enjoyed by the royal families from the East Coast. There’s more to this Ramadan spread if diners want something less “royal”. There are action stations serving roti John and murtabak. The buffet also boasts more than 100 mouth-watering specialities as well as international dishes including the steamboat counter and a sushi bar. Executive sous chef Kamarudin said it took the right skills and patience to prepare these famous dishes. 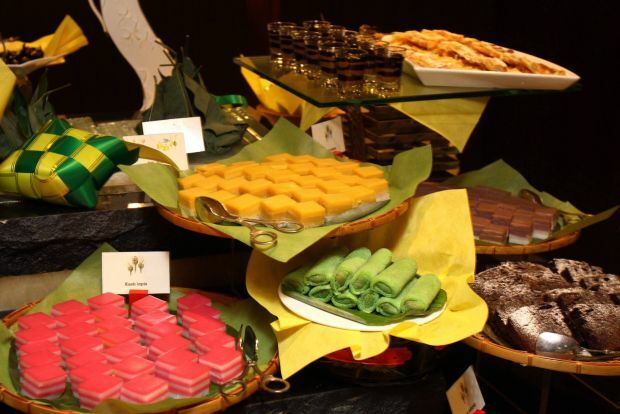 No buka puasa is complete without tempting desserts such as Bengkang Bunga, Pulut Tai Tai, Onde-onde Buah Melaka and other sweet treats. “Most of the cooking have to be prepared overnight to make sure of its quality and authenticity. “The balance is all about preparing it without under or overcooking it,” said Kamarudin. The buffet is priced at RM108++ per person and is available for dinner only from now to Aug 17. Besides a sumptuous meal, each guest will receive a golden chocolate egg in an organza bag.